The members of the literary circle known as the Violet Quill -- Andrew Holleran, Felice Picano, Edmund White, Christopher Cox, Michael Grumley, Robert Ferro, and George Whitmore -- collectively represent the aspirations and the achievement of gay writing during and after the gay liberation movement. David Bergman's social history shows how the works of these authors reflected, advanced, and criticized the values, principles, and prejudices of the culture of gay liberation. 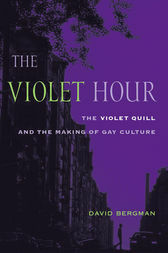 In spinning many of the most important stories gay men told of themselves in the short period between the 1969 Stonewall Riots and the devastation of the AIDS epidemic during the 1980s, the Violet Quill exerted an enormous influence on gay culture. The death toll of the AIDS epidemic, including four of the Violet Quill's seven members, has made putting such recent events into a historical context all the more important and difficult. The work of the Violet Quill expresses the joy, suffering, grief, hope, activism, and caregiving of their generation. The Violet Hour meets the urgent need for a history of the men who bore witness not only to the birth but also to the decimation of a culture.